Pictured left to right: Phirum Gau, Danh Pham, Jill Hesselroth (MDI board member), Jama Farah, Bruce Binder (3M Healthcare), Peter McDermott (MDI president and CEO), Joe Scanlan (Surgical Technologies), Linda Halverson (Richard M. Schulze Family Foundation), Angie Larson. Not pictured: Bob Klaus (Tapemark), Jim Vogel (Medtronic), Kim Mueller (Lifeworks). MINNEAPOLIS – Minnesota-based medical-device and technology manufacturers have a new option for kitting and assembly in a controlled environment. 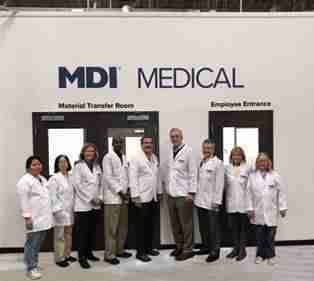 A new white room in MDI’s Minneapolis facility offers skilled hand assembly, kitting and packaging for medical products and other devices. The 2,000-square-foot room has a modifiable cell-floor layout that can be arranged for varying product-assembly needs. Two separate entrances – for material transfer and employees – reduce the risk of contamination. The white room provides a controlled environment for the assembly or repair of precision equipment. MDI also delivers dependable lot tracking and inventory control under quality-management standard ISO 9001:2008. The organization will soon achieve certification for ISO 9001:2015, the latest global standard in quality management, and is working toward ISO 13485:2016 for medical-device quality management. MDI is located among the concentration of medical-device manufacturers in Minnesota’s “medical alley,” and positioned for growth in this sector. According to GREATER MSP, nearly 700 medical-device companies have headquarters or major operations in Minnesota, and the industry has a $14.2 billion economic impact within the state. MDI is a leader in manufacturing standard and custom, corrugated-plastic packaging solutions, production assembly and environmental services. Through a social enterprise model, MDI creates self-sufficiency by providing meaningful work in an inclusive environment, with nearly half of the workforce comprised of people with disabilities. Headquartered in the Twin Cities – with additional locations in Hibbing, Grand Rapids and Cohasset, Minnesota – MDI offers an unparalleled customer experience while providing high-quality products and services to businesses and organizations.